Was Nostradamus Truly A Prophet? Did His Prophecies Come True? Was Nostradamus a real prophet and did his prophecies come true? Michel de Nostredame, or in the Latin rendering, Nostradamus, was a French doctor who later became a “seer” and published a collection of prophecies that were supposed to occur in the future. 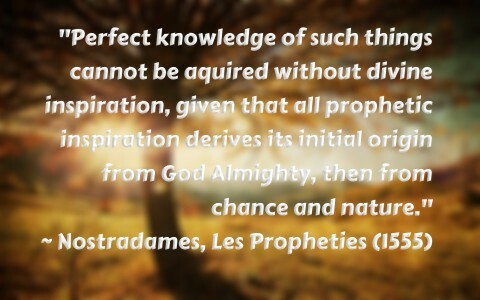 Even today, Nostradamus has many followers, and his book, “Les Propheties” (The Prophecies), is still a major seller that’s still available in print. Nostradamus tried again and again to enter different universities, but he was frequently unable to finish. He finally turned to the occult and began writing almanacs, and not that different from the Farmer’s Almanac that tries to predict the weather, however Nostradamus was more interested than just predicting the weather. He wanted to become a seer, and look into the future of human history. That is expressly forbidden by God. Nostradamus must have known this, being raised in church, however when he turned to the occult, an evil spirit may have given him certain, but limited power beyond most human ability. We really don’t know for certain. Nostradamus saw how his almanacs were being widely read, so eventually, he made a collection of these almanacs, and that is what came to be known as “The Prophecies,” however, these almanacs were not really written with the idea of what was to happen thousands of years later, nor were they written, as some claim, to prophesy future events like the fall of the twin towers and JFK’s assassination. I am always curious as to why some psychics go out of business. Shouldn’t they have seen it coming? People have always been intrigued with knowing what the future holds, so when Nostradamus saw that his almanacs were being read far and wide, and people started asking him for horoscopes and “psychic” advice, he decided to put these in a birth chart. Even today there are daily predictions based upon Nostradamus’ “prophecies” and a certain website even claims to have the right predictions for every day of your life, but rarely are these validated as being true. Nostradamus’ prophecies are so undated and so generic that it’s impossible to know to which event and when they apply? It’s like the horoscopes you might see in the newspaper (which God also forbids), but their predictions are so general that these things could happen to just about any one of us. Even more problematic for Nostradamus’ believers is the birth charts that he constructed were totally off, and because he was not a professional astrologer, his predictions are not even for the right dates. That means the person who’s reading them is reading the wrong horoscope because their birthday falls within a different range in Nostradamus birth chart. Because Nostradamus based his writings on the wrong astrological calendar, the accuracy of the birth charts is affected, and this means his prophecies are no better than a random chance occurrence of something happening, but even a broken clock is right twice a day. Prophecy is great but it can become a preoccupation as we do nothing but search for the latest news, always looking for a fulfilled prophecy, instead, we should be “looking to Jesus, the founder and perfecter of our faith, who for the joy that was set before him endured the cross, despising the shame, and is seated at the right hand of the throne of God” (Heb 12:2). Let’s just pray for those who are mixed up in these worldly things and for those Christians who are following someone who is supposed to be a modern day prophet. Even in the ancient days of Ezekiel, the so-called prophets “have seen false visions and lying divinations. They say, ‘Declares the Lord,’ when the Lord has not sent them, and yet they expect him to fulfill their word” (Ezk 13:6), so today’s “prophets” had better take Ezekiel’s warning seriously, because God says, “My hand will be against the prophets who see false visions and who give lying divinations. They shall not be in the council of my people, nor be enrolled in the register of the house of Israel, nor shall they enter the land of Israel. And you shall know that I am the Lord God” (Ezk 13:9). If you are not with God, you are against Him, and that ends badly my friend (Rev 20:12-15; 21:8). Something more that might interest you: Are There Still Prophets Today? Previous post: God Opens and Closes Doors: What Does That Mean?